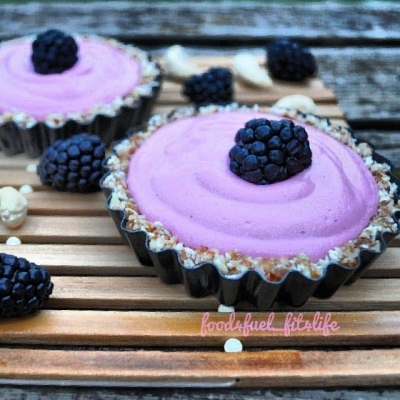 Yummy raw tarts made with cashews! These treats are raw, vegan, gluten free, sugar free and guilt free! 2.To create the crust first process nuts in food processor until small bits, then add dates and coconut and process until dates chopped. Stir in salt and coconut oil. Place in fridge. 3.Blend soaked cashews and coconut milk in blender until smooth, add agave, vanilla and salt and blend. Add the beet powder or juice 1tsp at a time until desired color is achieved (I used 5 tsp of beet juice). Place in fridge to chill. 4.Divide crust mixture into 4 parts and press into tart pans, spoon filling over top and place in fridge to chill and set for about 1hr. Garnish with fresh berries and serve.